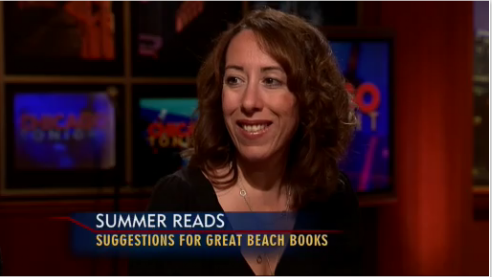 Last night, my excellent editor Gina Frangello was a guest on the TV show Chicago Tonight. Along with home-grown lit stars Audrey Niffenegger and Brigid Pasulka, Gina was supposed to recommend summer reads. Mark and I recorded the program, and I was all atwitter to see my friend and my book on the little screen. But we didn’t fast forward to the books segment. I haven’t watched TV in a week, maybe two, and I haven’t watched a local news broadcast like Chicago Tonight in who knows how long. It was relaxing and fun to sit back and be presented with the local take on local events, with the gentle host Phil Ponce setting a tone and pace not often seen on MSNBC or the Comedy Channel. I can see why people used to do this, I thought. And then, it was time! Gina looked great, sitting there with a neat stack of half dozen books by her elbow. And there was Currency, in a dignified position at the bottom of the pile because of its generous trim size, title nicely visible on the out-turned spine. Mark and I were drinking glasses of Grand Marnier, and we clinked them. But within moments of the segment, I began to worry. There was no way no how these three authors were going to have time to tout five or six books each, not with the leisurely retro mode of the show. What, there needs to be all this literary banter? (“Is there an optimal length for a summer read?”) And why was Audrey Niffenegger chatting so relaxedly about God’s Behaving Badly. Just give a soundbite, lady! Phil Ponce was pitching the titles to the guests, and the first one he tossed at Gina was Marcy Dermansky’s Bad Marie. Oh no, I thought. Oh well. Maybe they’ll show them all at the end, said Mark consolingly. Brigid Pasulka had a lot to say about Josh Wilker’s Cardboard Gods. Would they get a chance to mention even two books each? Why, yes, they would. Yes, they did. And there was the handsome host whose countenance I had admired on the sides of buses saying, within earshot of rock star Audrey Niffenegger, “Tell us about Currency, by local author Zoe Zolbrod.” Look, I’m not going for blase, here. I’m collecting authorial thrills, and that was one. Gina knocked it out of the park. Just in case you don’t believe me, a video of the books segment can be found here. And below I’m listing of all the books on the docket. Actually, I think I’m going to pick up Bad Marie. And Cardboard Gods sounds sort of brilliant. I already know Stations West and Some Girls are great to get lost in—and I’ve had the privilege of reading with both authors as well as with Marisa Matarazzo, another of Gina’s picks, on my book tour. Who has time to watch TV?